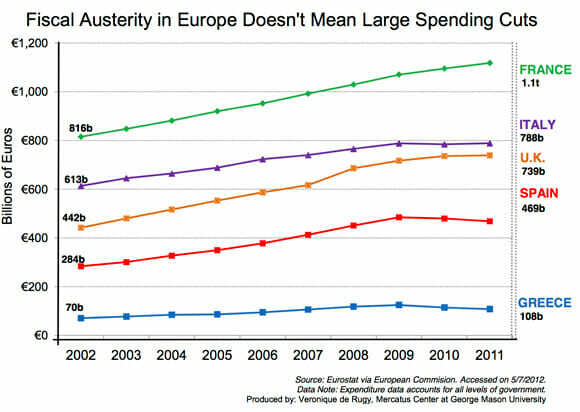 Coyote Blog » Blog Archive » OMG, Austerity! The UK line is particularly interesting, since that is the country that Krugman has declared is austerity-izing itself into a depression. As I have pointed out before, real government spending in UK has been and is still rising. The percent of GDP of this spending has fallen a bit, but there is nothing about Keynesian stimulus theory that says changes in the percentage of government spending is stimulative, only its absolute value. Here is one thing I would love to here Krugman et. al. opine on -- at what percentage of government debt to GDP does additional deficit spending become counter-stimulative. I imagine there is an inverse relationship for deficit-funded stimulus, such that it has a larger effect at lower debt levels with a zero to negative effect at higher interest levels. Yeah, posted that one on an earlier thread about the EU's issue... note that there is austerity (ie cuts in services that directly impact citizens). That was the thread where I learned the fine term "Washington monument syndrome". Essentially, it's the same we have here in the US: a crisis propagated by trying to save economically infeasible structures, but in the EUs case you have some politicians playing with fire (essentially some southern countries are attempting to hold the northern ones hostage by putting the thumbscrews on their own populace). How can they stand such deep cuts to spending? Oh the inhumanity of it. I think we should move all the means of production to the government and let them pay the debt from their sales revenue. Get rid of the middleman, those greedy corporate robber barons. Next we close all state and municipal governments and move their functions to Washington DC where all the smart people are. Just think of all the economies of scale we'll enjoy when Washington has total control of everything. I wonder what the economy would look like if there was no public debt, and all the money currently going for interest was available for other uses (public or private). I would think that the extra money would be a great stimulus. Any comments? "Here is one thing I would love to here Krugman et. al. opine on — at what percentage of government debt to GDP does additional deficit spending become counter-stimulative." What Krugman thinks but won't say is that the actual 'austerity in the UK' has been in the form of tax increases rather than spending cuts. But Krugman OBVIOUSLY doesn't want to be on record as opposing tax increases. So he talks vaguely about 'austerity'. There's an argument to be made that Bush drove Krugman insane and into a lot of mistakes trying to make the case against him, but you won't get far arguing that he's a simpleton who just can't get his head around the points made here. He's willing to go to far about politics and motivations of his political opponents, but on the straight economics he's legitimately brilliant. If you want the government to start cutting spending you've got to explain how the private sector can deleverage without crashing demand and leading to major depression. The only alternative is for government to provide the net financial assets so the private sector can return to a sustainable level of debt and return to growth. They aren't revenue constrained so they can play that role and there's a strong case that they should. What's the alternative? The accounting math has to work out in the end. 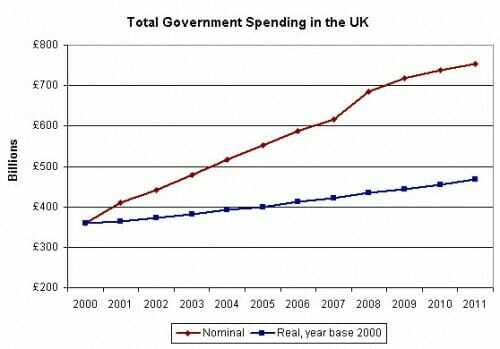 Everybody's spending is somebody's income, so any spending cutbacks (debt repayment) by the private sector as a whole cuts the private sector's income which reduces their ability to save, which reduces income and so on. How do you break that cycle when it hits like it is now? 2. Indebted governments that can't issue their own currencies either renegotiate or outright default on their obligations (Greece, California, Jefferson County). >>> How do you break that cycle when it hits like it is now? You don't. Writing down bad investments (which are inevitable) is a natural part of the business cycle. All government intrusions do is hold off taking down malinvestments until they're even worse. Booms and busts used to be short term and localized. It is only with big government that they've become international in scope and half-decadal in term. After the bad investments are finally completely disposed of and their remnant asset values redistributed into new hands does the growth cycle resume. The only reason for the minor growth right now is that the government has forcibly slowed some malinvestment liquidations, which puts them off until later. The net effect is going to be prolonging the misery, not reducing it.